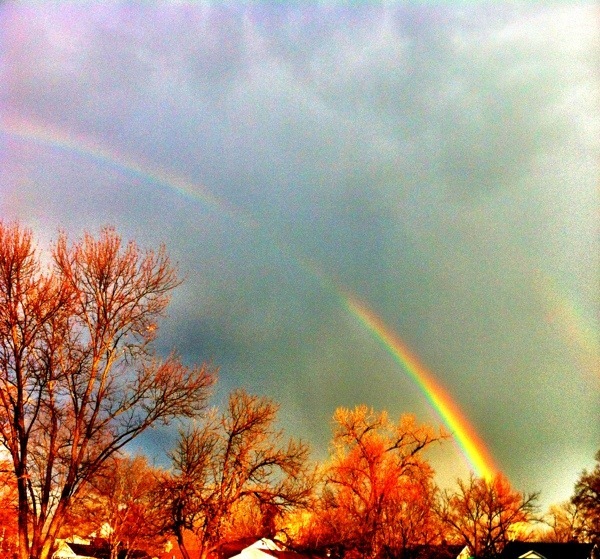 Ok, I lied about the unicorns, but the rainbow was real! A double rainbow at that. We walked into a fabulous rainbow one morning which almost made us late for school such was it’s wonder. The first thing most people I met that morning asked me was, did you see the rainbow? What a wonderful thing to start the day with! So, I had to take a few photos. I know, shocker! 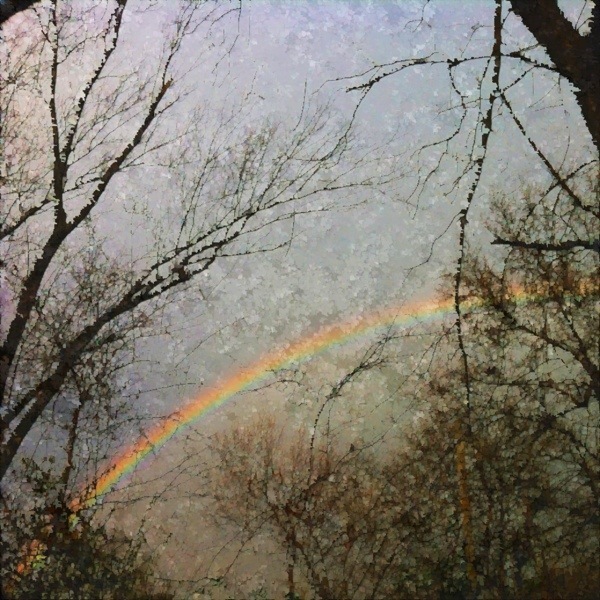 I have taken full advantage of the rainbow and my iPhone 4 photo apps and I have made some cool rainbow pictures. This photo is cropped using the square cropper in Camera +. 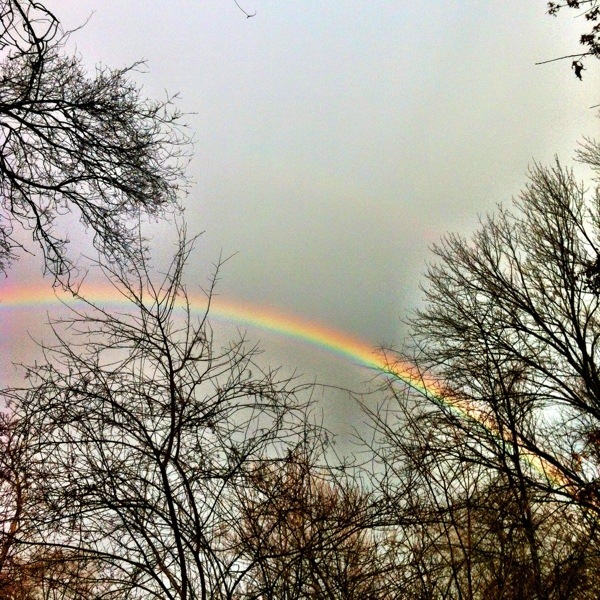 I cropped it to highlight the rainbow and frame it with the winter trees. I added the Vibrant filter. On top of that, the Clarity ‘scene’. I used Camera+ to crop out the rooftops. Then I added Clarity in ‘scenes’. There, the second rainbow becomes clearer. Into Filters and add Vibrant at 80%. Don’t forget to save! I know this is a cheesy filter effect, but I like it! Crop in Camera+. Vibrant 100%. Save. Re-open in Laminar Express. Go to Filters, Stylize, Watercolor. Ta-Dah! 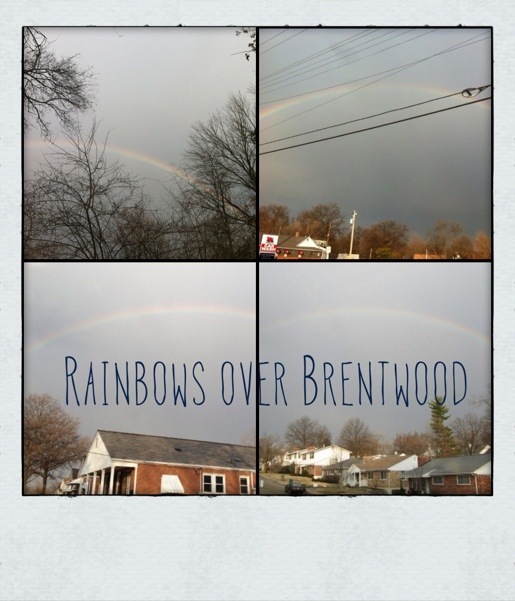 Three of the photos on this picture were taken by friends of mine who are local and took photos of the rainbow too. So I swiped the snaps from Facebook with a screen shot and added them to mine in a quadruple rainbow montage. Open PicFrame and find the 4 square frame. Add each rainbow and adjust in the square to get the rainbow positioned. Save and reopen in Overgram. Add text and change to font to Goon. Size the text and position so that it can be read. Save and reopen in Camera + and add the Instant Frame. I am an Orla Kiely fan and I do buy the ‘printed’ Method products. I am also a fan of the smell of green houses full of tomatoes. Takes me right back to my Grandad’s garden and picking the tiny tomatoes off the vine and eating them, warm from the sun. 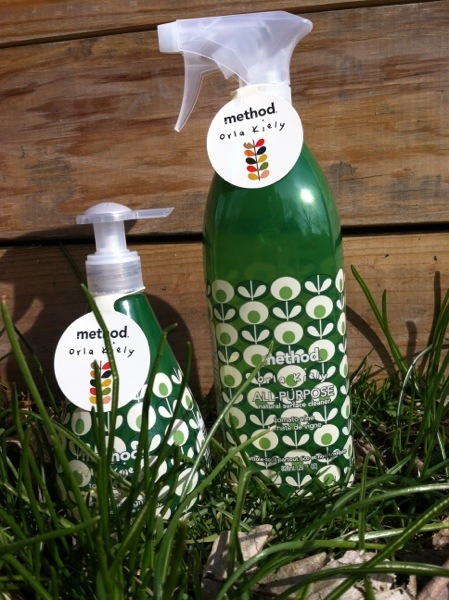 Imagine my joy at seeing not only a new Orla Kiely for Method range in Target today, but that the range is Tomato Vine smell! Love. What is your favourite smell? Are you seduced by pretty packaging like me? Favourite photo apps? Do share. Previous PostI want a friend with a cafe and other pressing needs.